Many people have thought many things about Grand Funk Railroad, but chances are, no one ever thought they were politically conscious, despite songs like "People Let's Stop the War," "Save the Land," and "Freedom Is for Children." That's only one of the reasons why the double-disc Bosnia seems so odd: it's hard to believe that the band had even heard of Bosnia, much less care about what was happening there. Evidently, the Bosnian ambassador went to high school in Cleveland, where he became a huge Grand Funk fan, and years later, that somehow led to the band giving a Bosnian relief benefit concert in Detroit in the spring of 1997. Since this was a special event -- not only were they reuniting, but they were doing it for a cause -- the trio decided to augment their lineup with a four-piece horn section led by the Silver Bullet Band's Alto Reed and, on occasion, the Detroit Symphony Orchestra, which was under the direction of notorious Letterman lounge lizard Paul Shaffer. It's a lineup that flirts with kitsch, and since nobody involved with the project realizes that, it's even weirder and campier than it would be if the whole thing was intentional. 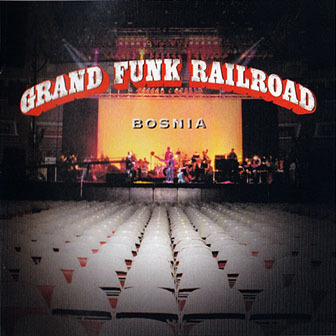 So, Bosnia captures the bulk of Grand Funk's set, featuring 20 songs over two CDs. Of course all of their hits are here. It's the kind of overblown performance that has been out of favor since the late '70s, and it does sound outdated in the '90s. Naturally, that means that anyone who wasn't already a Grand Funk Railroad fan will be repelled by the sheer size and sound of Bosnia, but for those who have loyally stood by the band over the years, it's an interesting set, even though it's more of a memento than a real record. — Stephen Thomas Erlewine.